It has been four years since we started offering our „Active & Cappucino“ cruises. Featuring a well-done blend of swimming, sunbathing, short bike tours, sightseeing tours, guided walks and easy hikes, these itineraries could be best described as „active light with a twist of culture“. 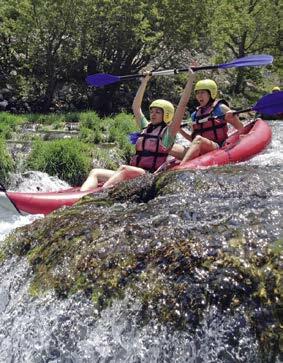 The kayak safari, including a picnic beneath the waterfalls, is one of the finest highlights to be mentioned. 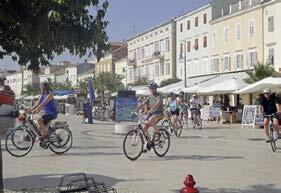 The program – always accompanied by a guide – is perfect for all those who would like to spend their cruise time not only on the sun deck and in the crystal-clear waters of the Adriatic Sea, but still do not want to participate in daily bike rides of 40 or 50 km or hours of hiking. And of course there will be enough time to relax or to enjoy a cappuccino. Our “Active & Cappuccino” cruise is also suitable for families with children, because kid’s bicycles are available on request. Following the motto “You can do it all – or just relax”, you can decide, which activities you wish to participate in, or if you prefer spending a day or more on board simply relaxing and enjoying your free time. From 11:30 am to 1:00 pm, boarding time in the port of Rijeka, our bicycles are awaiting you already on board. If you arrive by your own car, you can proceed to the port already from 10:00 am. Our service-team will lead you to the garage where you can leave your car. Of course, they will also bring you back to the port. After embarkation, our representatives and guides will welcome you aboard with a drink and you will meet the crew and your fellow passengers. After a lunch snack “Cast off!”, heading towards the island of Cres. We drop anchor in one of the bays with crystal clear water to jump into the refreshing waters of the Adriatic Sea for the first time. Then we continue to the town of Cres. Upon arrival, you can choose to come with us on a bike ride to the Franciscan monastery (20 km round trip) or to take a walk along the coast. Dinner on board, afterwards walk through the lovely town. Overnight stay in Cres. After breakfast, we head towards the island of Lošinj. We pass the southwestern coast of the island of Cres and enjoy a long break for swimming in a beautiful bay. We continue our journey, and after lunch on board, we enter the port of Mali Lošinj. The island of Lošinj is covered with pine forests, and is well known for its 300 cloudless or only slightly cloudy sunny days per year. With a bit of luck we may even see dolphins playing in the waves, because the waters surrounding the island of Lošinj offer home to more than 160 dolphins registered by the “Adriatic Dolphin Project”. After arrival in Mali Lošinj, we invite you for a cappuccino in a café on the promenade. Afterwards, we will visit the “Mediterranean Fragrant Garden”, where more than 250 different kinds of plants are grown. On our guided tour through the garden, we will have the opportunity to learn more about some of them. The fragrant garden is approx. 1 kilometre away from the port, so you may decide whether you prefer to take a walk or to go there by bike. Our first destination of the day is the island of Molat. Starting from the pier of the village Molat, we go by bike to the village of Zapuntel, and then on the same way back to our boat (approx. 21 km). Those who do not want to take the bike tour, can participate in an easy hike across the island. During lunch on board we head to the islands Zverinac, Sestrunj or Rivanj, where we drop anchor in a bay. After a swimming break, we head towards Zadar, the former capital of Dalmatia. After docking in Zadar, our local guide will accompany you on a tour through the old town, which is surrounded by impressive walls and offers many historical monuments. The guide will show you the main attractions – such as the Roman Forum, the Round Church of Sveti Donat (St. Donatus), the Cathedral of Sveta Stošija (St. Anastasia) and the unique Sea Organs – their sounds and “melodies” are created purely by the movement of the waves. Afterwards, you will have the opportunity to have dinner in one of the restaurants or konobas, and then enjoy a stroll on your own along the “Kalelarga”, the traffic-free main street of old town. Sip a drink in one of the many cafés or – with a bit of luck – listen to the songs of a “klapa”. Overnight stay in the port of Zadar. After breakfast, bus excursion to the Zrmanja River. Here we will take over our kayaks, and after a briefing we will head down the river over rapids and waterfalls (in case of very high water levels the excursion will be carried out as rafting with large inflatable boats). At lunchtime we will have a picnic at one of the most beautiful parts of the river, where you can swim under the water- falls in crystal clear waters. Then we continue paddling through the Zrmanja Canyon with its unique scenery and bird life. Bus transfer to Mandre on the island of Pag, where we will return to our boat. Dinner on board, overnight stay. The Island of Pag stands out above all by its extremes – partly meagre like a lunar landscape, partly covered with lush green mountain fields, where numerous sheep graze, “producing” the famous Pag cheese. By the way, the cheese and the meat of the lambs bred on the island of Pag owe their special spicy flavour to the fall wind Bura that blows here especially in winter time, spraying salty sea water on the sheep pastures. By boat we continue from Mandre to Novalja, where we can decide whether to ride by bicycle (approx. 20 km) or sail by boat to Lun at the north-western tip of the island. After a swimming break and lunch on board, we set off for Rab, the capital of the homonymous island. The old town of Rab with its unique bell towers stretches along a narrow rocky peninsula, surrounded by water on three sides. Three streets run through the old town – the “Lower Street” (Donja Ulica) with cafés and pubs, the “Middle Street” (Srednja Ulica) with boutiques, souvenir shops and ice cream parlours, and the “Upper Street” (Gornja Ulica), which will take you to the four churches with their bell towers. Guided tour of Rab, then a hike along the seashore to the Franciscan monastery of St. Euphemia, where you will also find the Ethnological Museum. Possibility to have dinner in Rab, overnight stay on board. After breakfast, we take an easy bicycle tour through the pine-covered peninsula of Suha Punta (approx. 25 km). Those who wish to take a more challenging tour can alternatively enjoy a “mountain hike” on the Kamenjak (408 m). The mountain not only protects the city of Rab from the cold north winds; it also offers a fantastic view on the Velebit mountain range, the islands of Cres, Lošinj, Silba, Olib, Krk and Pag, the town of Rab and the Natural Park of the peninsula of Kalifront. After returning on board with plenty of appetite, we will enjoy lunch and leave the port of Rab, heading to a bay in the north-western part of the island. Here we will anchor for a swimming break, before continuing to the Island of Krk, where we will spend the night and enjoy Captain’s Dinner. After breakfast, our guide will invite us for a walk through the historic town and show us the most important sights. 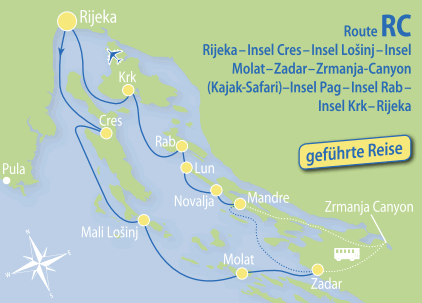 Afterwards, we will leave the Island of Krk, sailing in direction to Rijeka. On our way to Rijeka, we will have plenty of time to enjoy lunch and a last refreshing dip in the crystal clear water of the Adriatic Sea. After this last swimming break, we will bid farewell to the Adriatic Sea and enter the port of Rijeka. Once we moored the boat, we take a walk to the sanctuary of Trsat, a pilgrimage site above the town. You will not regret climbing the 485 steps because from the fortress you will enjoy a magnificent view over the entire Kvarner Bay. Afterwards you can go out for dinner to one of the numerous restaurants ashore. Overnight stay in Rijeka.